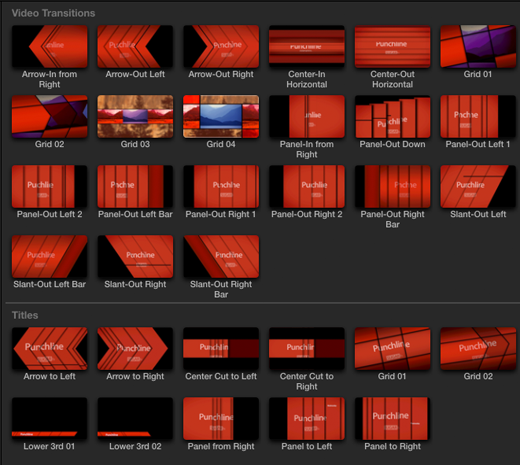 Broadcast Design titles and transitions for Final Cut Pro X users. Punchline is a collection of Titles and Transition elements that have been designed by our Broadcast Design team with the goal to bring professional looking elements to the casual and professional editor using Final Cut Pro X. This is a collection of 32 High Definition elements which include 11 titles and 21 transitions, all customizable and easy to adjust right inside Final Cut Pro X. With Punchline you can have many options for your titles or transition effects to choose from and the controls are simple and easy to use and understand. Some of the panels in the titles as well as the transitions will have the function to enhance the footage right within the element itself. This versatility allows the user to have several looks and styles with just one element. Also, some of the transition elements have been designed to take advantage of the best capabilities found inside Final Cut Pro X, such as the ability to choose from the editing timeline, the content of the panels that conform the element. Simply drag the numbers that become visible in the timeline and the corresponding panels will show the exact frame that you want in your transition element. All the elements in Punchline have been designed by professionals with the look and feel of motion graphics in mind, with elegance and dynamic moves. You will appreciate the complex use of mattes, text effect, color modes and dynamic animation that makes Punchline so unique, and you know that this type of elements would take hours to achieve in any application. Punchline puts all that complexity and style within reach, with just a click or two away to become part of your finished piece. You can download and install the free trial of Xflare as part of FxFactory.